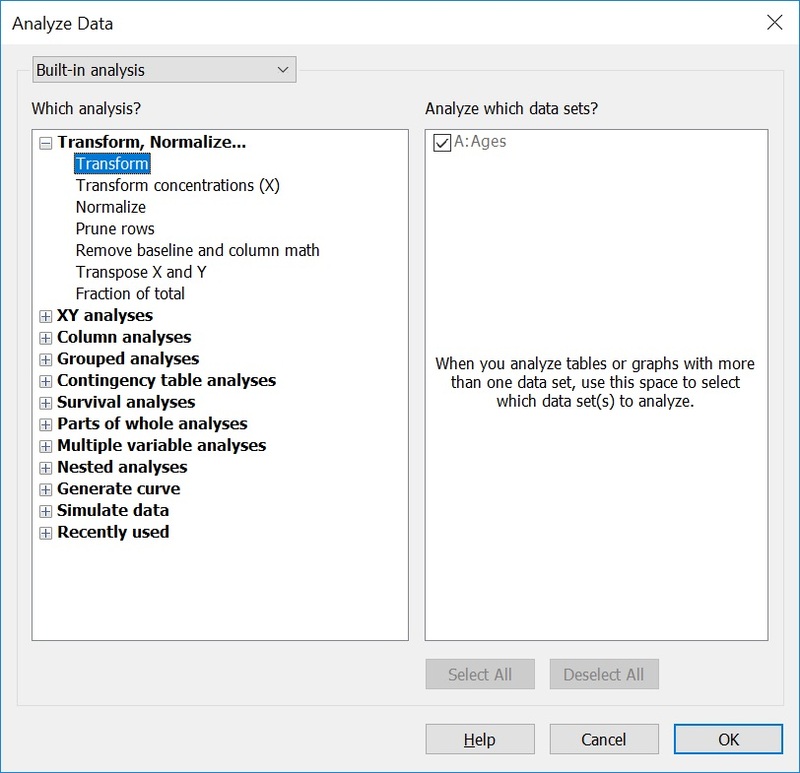 In this guide, I will show you how to log transform data in GraphPad Prism. Why bother log transforming data? There are two main principles as to why you would bother to log transform your data: to enable data to conform to normality and to make data visualisation more visible. Log transforming can aid by making highly skewed data less skewed. This may then make the data normally distributed to enable the use of parametric statistical testing. Further, it is often difficult to see data points on graphs when data are heavily skewed. By log transforming data, this aids to view the data points more. In GraphPad Prism, log transformation is possible using the base of 10 or 2. In this guide, I will show you how to do both by using an example data set of a group of participant ages. 1. Find the ‘Analyze‘ button at the top and click on this. 2. In the new window, select ‘Transform‘ under the ‘Transform, Normalize …‘ header. Ensure the data sets you want to transform are checked in the window on the right, then click the ‘OK‘ button. 3. In the ‘Parameters‘ window, click the ‘Standard functions‘ option under the ‘Function list‘ header. Under the ‘Transform Y values using‘ drop down menu, find and select the ‘Y=Log(Y)‘ option. This will perform a log transformation with the base of 10. If you have X values that you wish to log transform, then select the ‘Transform X values using‘ option instead. To perform a log transformation with the base of 2, select the ‘Y=Log2(Y)‘ option from the drop down menu instead. Click the ‘OK‘ button to run the log transformation. 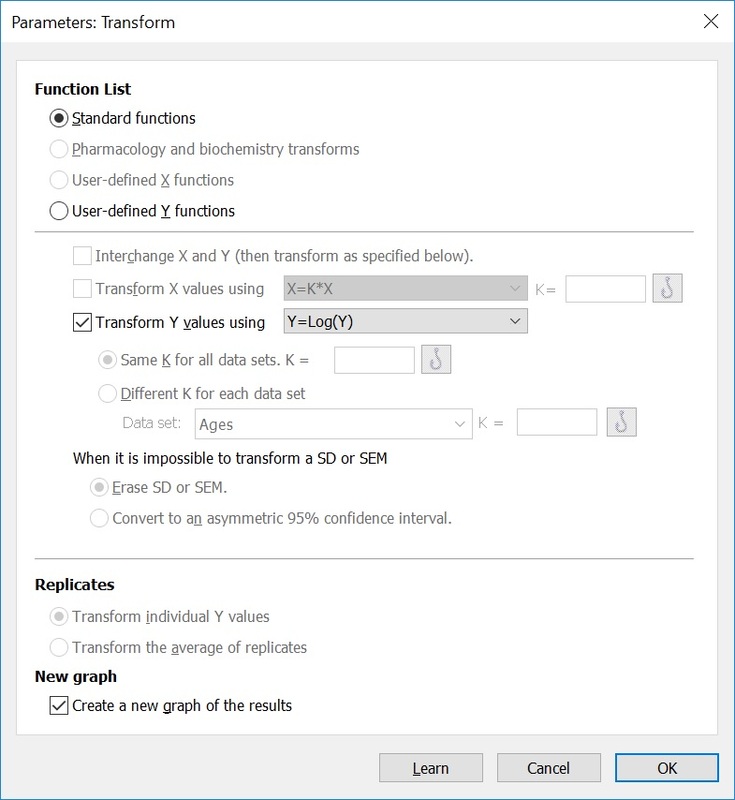 When performing the transformation, GraphPad will place all of the transformed data into a new results sheet. The good this about this is that new statistical analyses can be performed directly from this results sheet.